We never expected it to be a holiday. When a group of volunteers, including members of the Rotary Club of Doncaster, decided to travel to Bougainville, in Papua New Guinea (PNG), to see for themselves the plight of the Carteret Islanders and to find out how we could best help them, we knew there would be challenges. We were not, however, expecting it to be as difficult as it was to get, what is now known as the First Wave Project, off the ground. We hope in sharing part of our story we can inspire and caution any other Rotarians looking to embark on their own project overseas. We were invited by the people of the Carteret Islands to help them find funding for their relocation to Bougainville, an autonomous region of PNG. 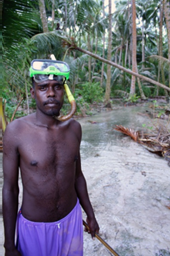 Due to inundation by seawater, the six coral atolls that form the islands have become almost uninhabitable and the people have already started to move to a new settlement at Tinputz, about 60 km south of Buka, the capital of Bougainville. Our party traveled to Bouganville in 2012, We prepared well for our journey: we registered the project with RAWCS (who gave advice and travel insurance cover), we made careful plans (including health, safety and evacuation), drew up checklists and sought advice from experienced Rotarians who had worked in the Pacific region. However, despite all this preparation, things did not always go smoothly; we had to change our departure date twice, one of the team members left his passport behind in a plane (we did recover this thankfully before the next flight) and when we arrived in Bougainville, our hosts changed our itinerary. Instead of a sedate, one-hour road journey to the township of Tinputz, we travelled by sea in an open six-metre-long boat. The following day, we were invited to travel to the Carteret Islands, 86 km across the open sea, in the same small boats. Although this proved to be a remarkable experience,-we got to see, first-hand the dire predicament of the people on the islands-we did not then have time to meet with government officials on Bougainville to hear their perspective on the situation. 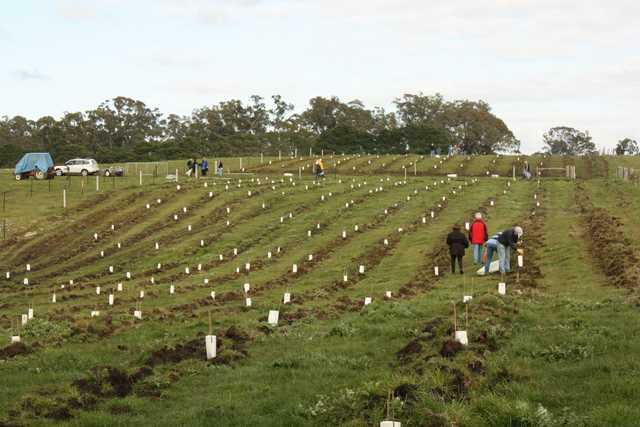 Instead, we met many of the wonderful people of Tinputz who have welcomed the Carteret Islanders to their township, as well as the resourceful Carteret Islanders themselves who have started to build a small community and sustainable plantation on land donated by the Catholic Church. The Carteret Islanders’ story is one of determination, courage and resourcefulness. Rotary has already helped the Islanders with an outboard motor for a fishing boat, computers and gardening tools. The First Wave Project is now putting together a plan to find additional funding for important projects, such as sanitation, and to send across much-needed books, computers, hospital beds and other essential items to the people on the Carteret Islands and the new community in Tinputz. This planning has been beset with its own complications; communication has been difficult, because of cultural and language differences and poor Internet connections, and our two main contact people have been hard to get a hold of, due to lost mobile phones and frequent travel to remote areas. In the first stages of this project, we have already learnt many valuable lessons. Working as a volunteer in another country, you have to fit in with the locals’ way of doing things, in their time. Things can’t be rushed; it is all about building respectful relationships and trust. We hope that we will be able to help them, but it has to be on their terms and meet their needs. So far The First Wave Project has been no holiday. Instead, it is just the beginning of a long journey with many challenges and the hope to benefit all concerned. 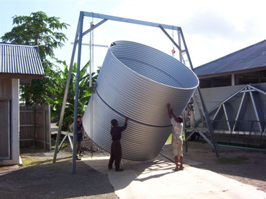 You can read more about this project in a report prepared after our visit to Bougainville on http://www.rotaryclubofdoncaster.org.au.